We love the legendary classics! 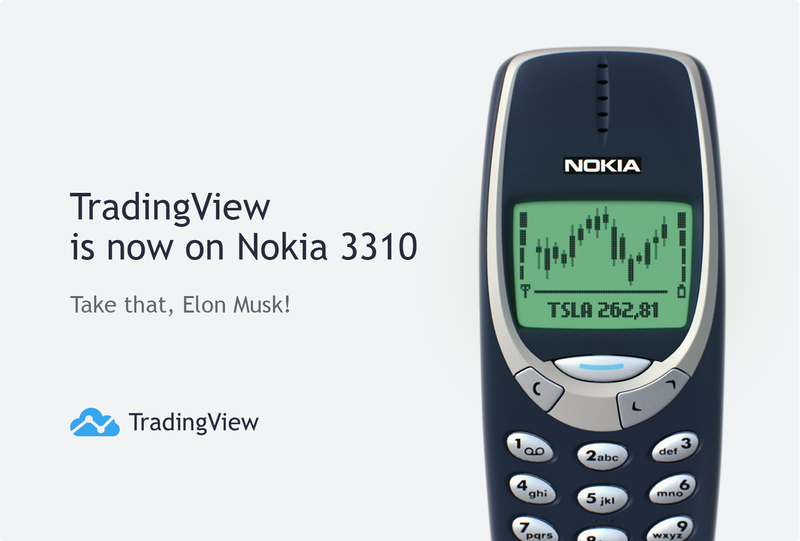 TradingView charts are now available for the Nokia 3310, both the remade version and the older style. 16-bit charting in full-color, 12Mb of personal storage space and convenient arrows for moving around. Explosion-proof, fire-resistant and (apparently) turns back floods. Drop it like it’s hot. Or not. You might break the floor. Now you can have quick access to your favorite charts on the go, under the hot desert sun, in the deep blue sea or even on the surface of Mars. The app is based on a modified Nokia 3310 firmware. Once you’ve installed the firmware you’ll still have access to phone calls, text messages, alarms etc. Unfortunately, due to insufficient built-in memory, games won’t be available. You’ll need a computer with Windows 98/XP/2000 (or a newer version) installed. The app is just as robust and reliable as a phone that it was designed for. * Some exchanges require a paid plan. ** 2 or more Nokia 3310 phones are required.